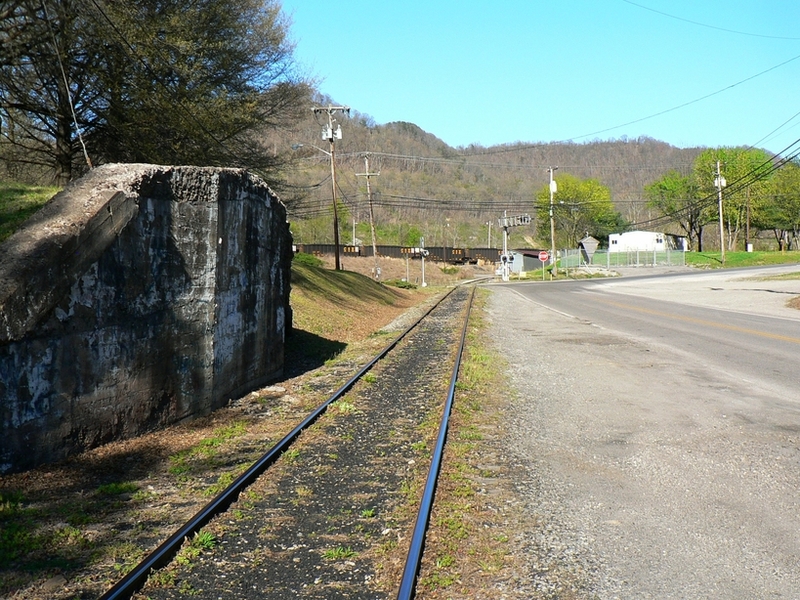 If one were to search for a railroad on a small scale that encapsulates Appalachian coal operations, the former Winifrede/current Big Eagle Railroad of today just might be the recipe to satisfy the appetite. Roughly six miles in length, it retains charisma from a bygone era and an interesting operational layout packed into a small area. Included in this venue is a river coal dock, a small marshaling yard, jointed rail track that literally parallels a road, and an old engine house from years long since passed. The creek valley through which it runs enhances the setting as does the small community atmosphere of which it touches. Its lifeblood is a mining load out at the end of the line and its connection to the broader world an interchange with CSX near Chesapeake, WV. 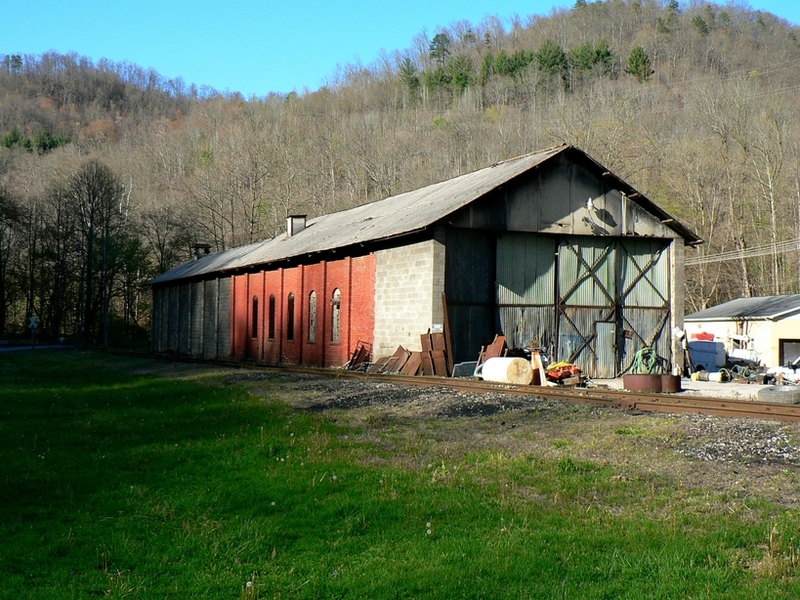 Its foundation is a history that predates the Civil War establishing the Fields Creek drainage among the earliest railroad locations in West Virginia. 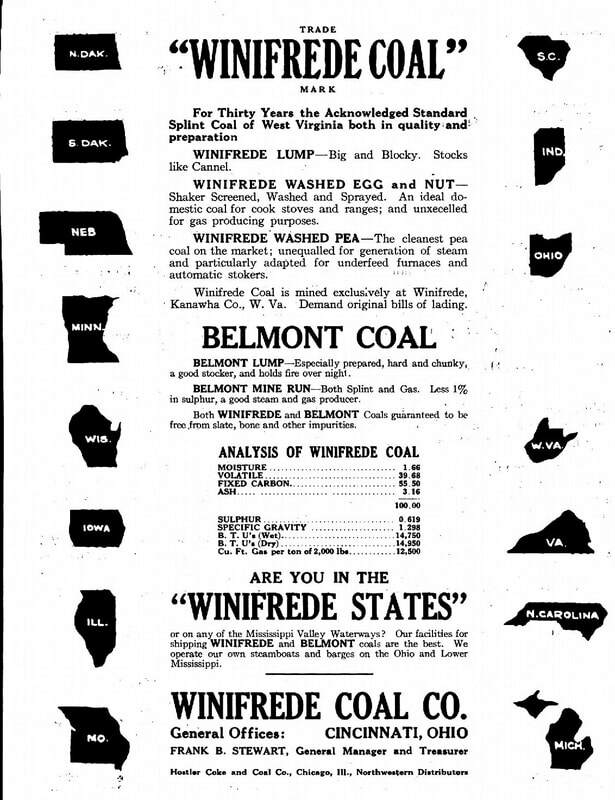 1914 advertisement for the Winifrede Coal Company and the market it served. 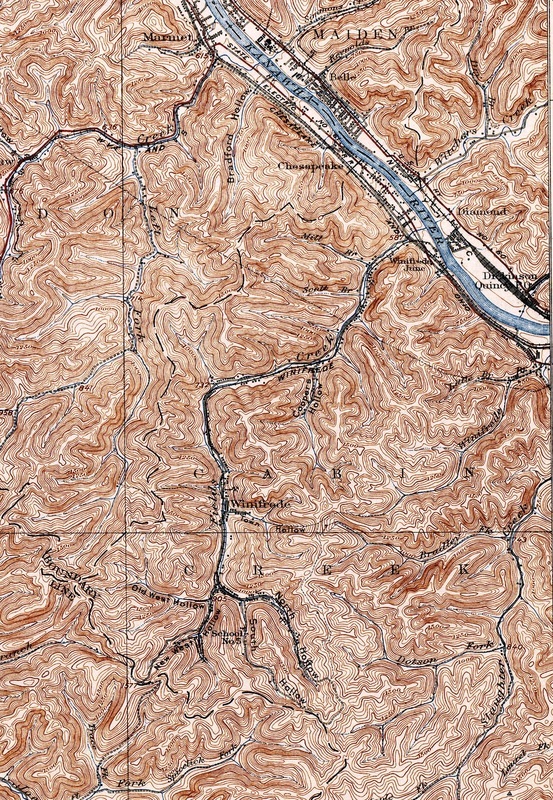 A 1926 TopoMap of the region that encompasses the Winifrede Railroad known today as Big Eagle. 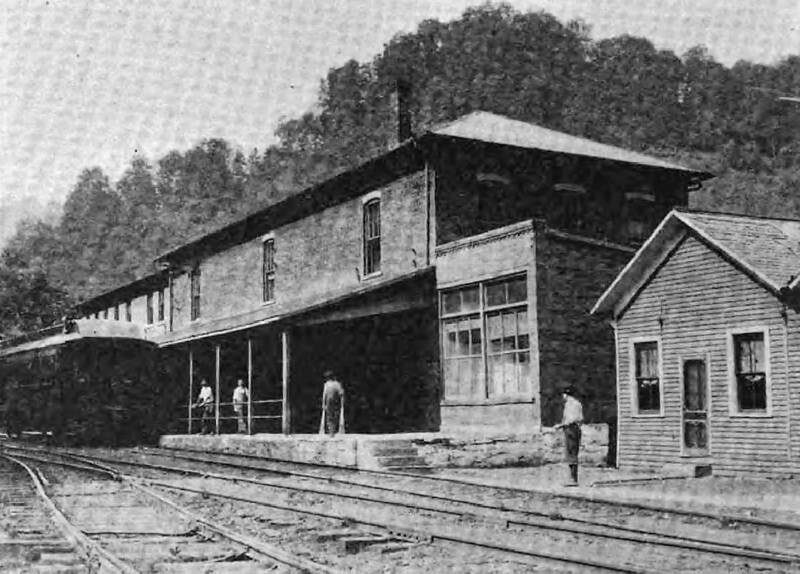 The railroad hub, located along the Kanawha River at the south end of Chesapeake, included a river port and small yard where it also interchanged with the C&O Railway (Winifrede Junction). 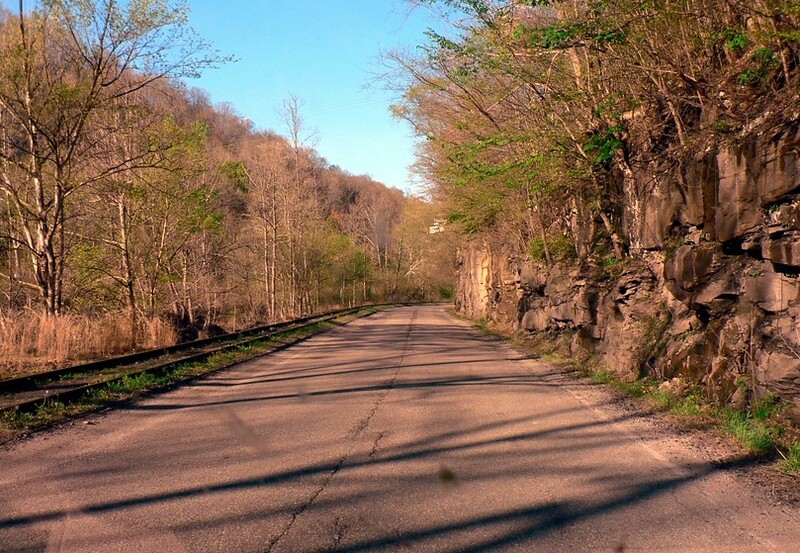 ​Upon leaving Chesapeake, the railroad follows the Fields Creek drainage through the town of Winifrede and beyond to the mining regions in the upper reaches of the creek basin. 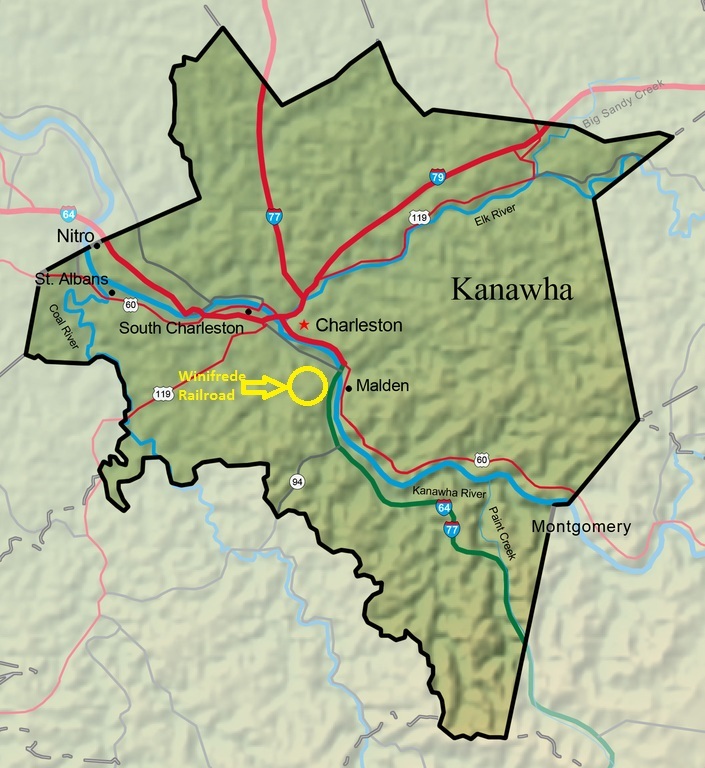 Long before the Chesapeake and Ohio Railway began constructing a route through the New and Kanawha River valleys, a short narrow gauge railroad was operating on Fields Creek hauling coal to the Kanawha River. Its origins date to 1853 with the establishment of the Winifrede Mining and Manufacturing Company which began mining coal in the Fields Creek drainage. 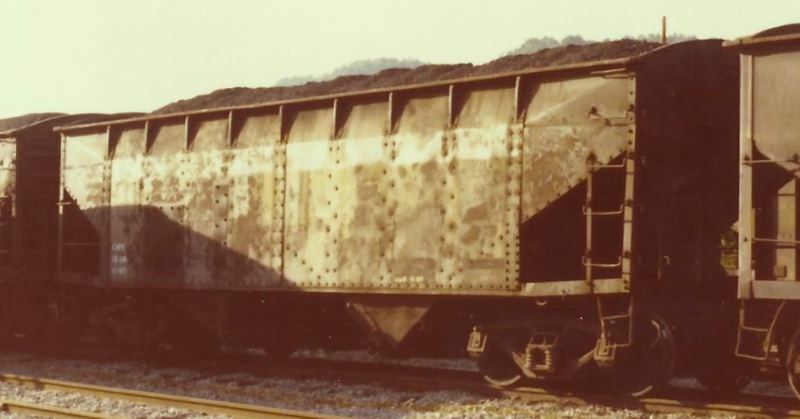 The following year an English railroad civil engineer, Ralph Swinburg, was hired by the company where upon he constructed a narrow gauge railroad to haul the coal from the mines to a barge facility on the Kanawha River. 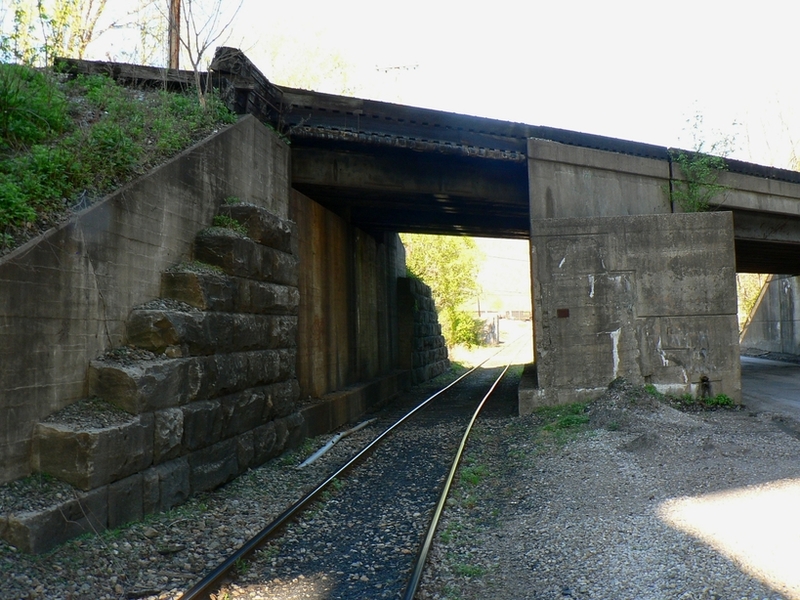 Before he retired in 1855, he would construct another line to serve the early mines located in the Paint Creek basin. ​Coal mining was a fledgling industry in the antebellum period---the years predating the Civil War. 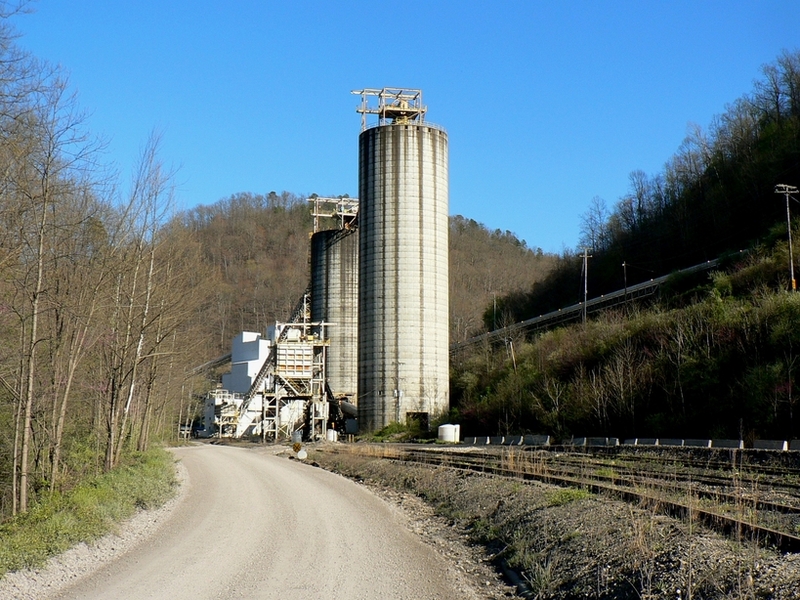 The first great industrial use in the Kanawha Valley for coal was in conjunction with the salt industry. 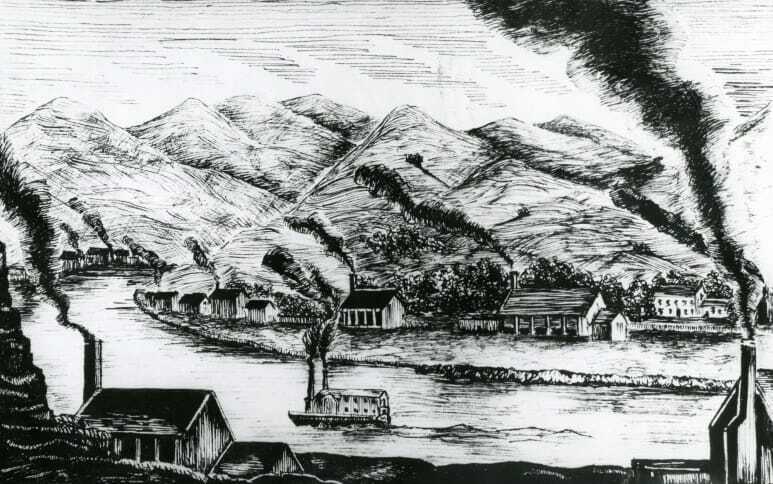 The region across the river from Winifrede was the concentration of the Kanawha Salines and other salt manufacturers centered at the town of Malden. The process of extracting the salt from bromine pumped from wells required hot temperatures of which coal could produce. This industry, large as it was, reached its pinnacle on the eve of the Civil War. Although operations continued during the war years producing a commodity vital to both sides, it decreased due military occupations and destruction. The industry never fully recovered. 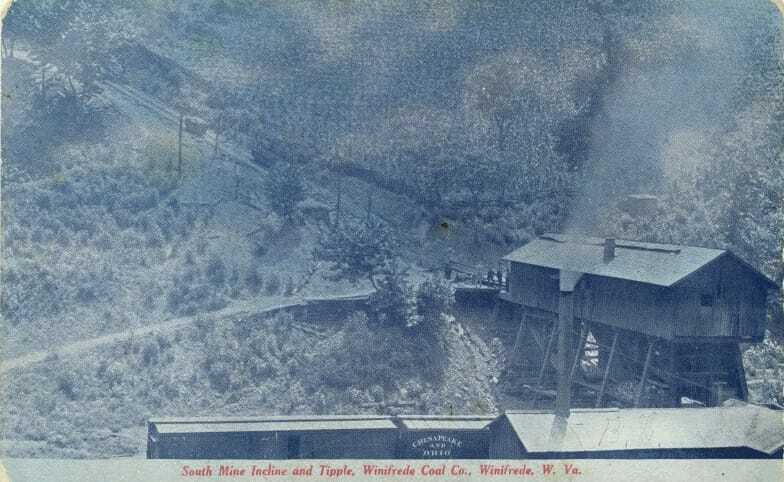 ​In the years before the arrival of the C&O Railway, water transport on the Kanawha River was the sole method of transporting Winifrede and other valley coal in large quantity to market. It was a vulnerable mode of transportation due to either high or low water levels in the river. In 1858, for example, a period of low water on the Kanawha created a 14,000 ton stockpile at Winifrede. There was no practical alternative method of transport. 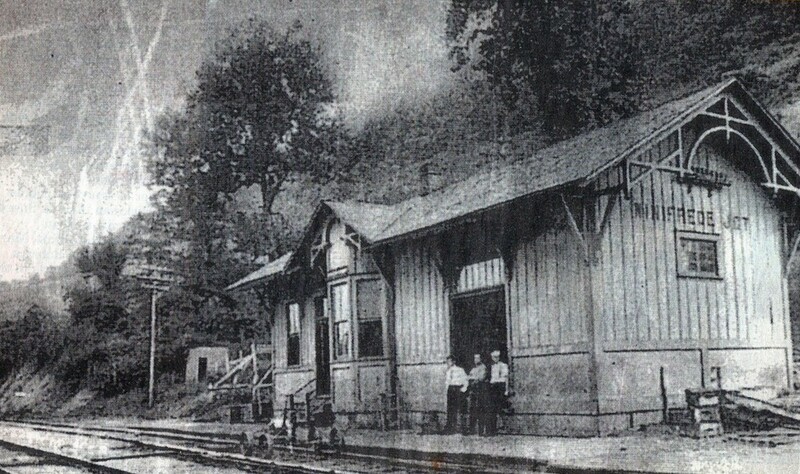 The Winifrede Junction depot along the C&O mainline as it appeared in 1906. 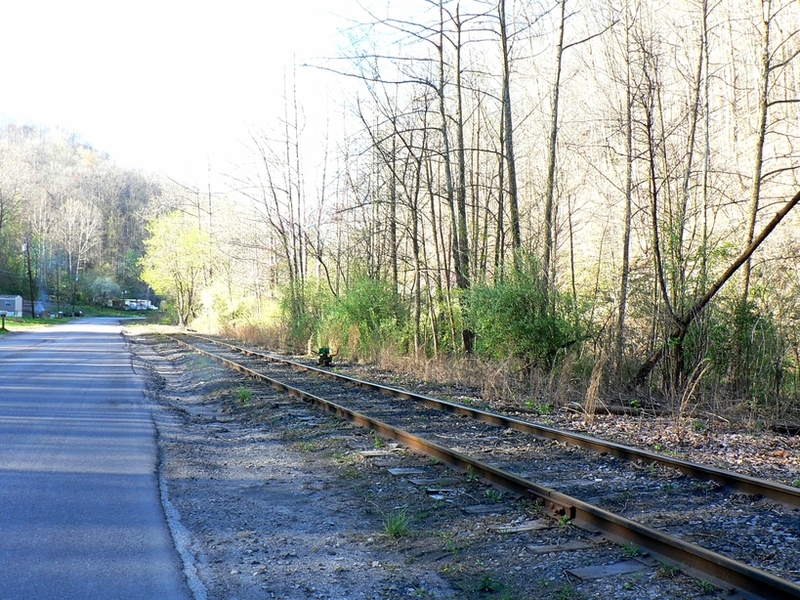 Trackage rights enabled the Winifrede Railroad direct access to this station stop. Image courtesy Charleston Daily Mail. 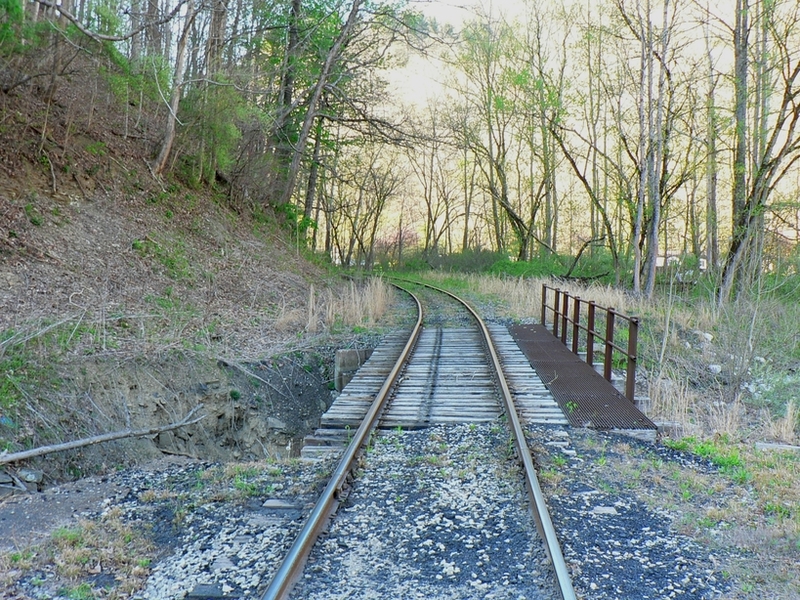 Although the existence of a railroad on Fields Creek has surpassed a sesquicentennial, it has not been a continuous operation as its history has been interrupted by idle periods. The eve of the Civil War era (1858) marked the first shutdown and the years following essentially ended the operation as first practiced. 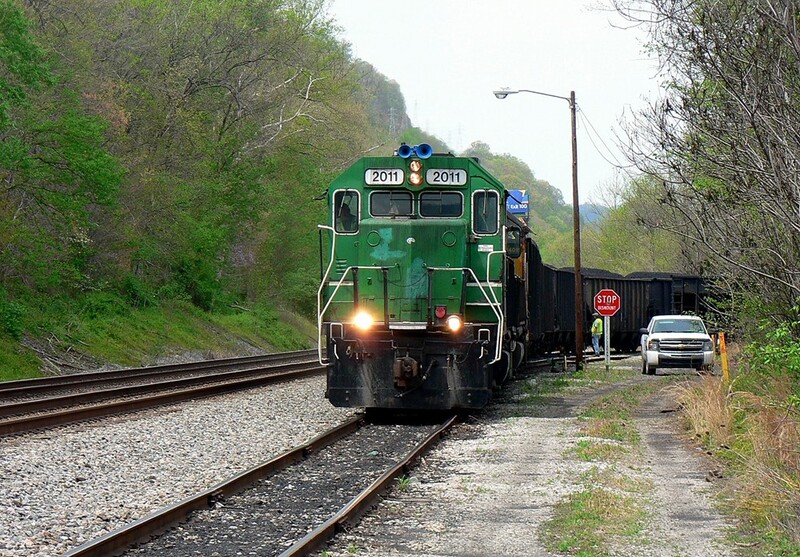 In 1873, the Chesapeake and Ohio mainline was completed through the Kanawha Valley and it was at the beginning of the next decade that the modern Winifrede Railroad entered into existence. ​In 1881, the Winifrede Railroad was officially chartered and began service the following year. The salt industry that was once dependent on the coal from the Fields Creek mines was a memory now and replaced by the demands of the Industrial Revolution. 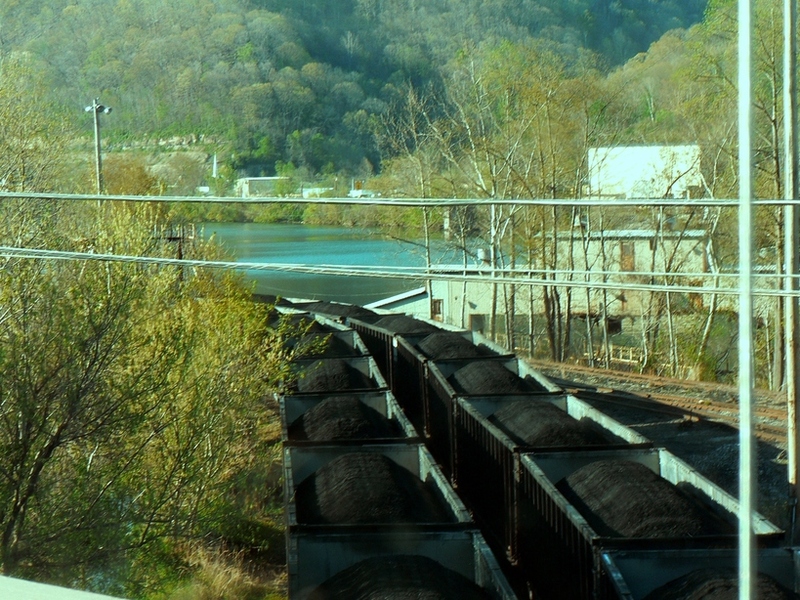 For the next century, the Winifrede would contribute to the vast amount of coal mined in West Virginia to feed a rapidly developing heavy industrial economy. 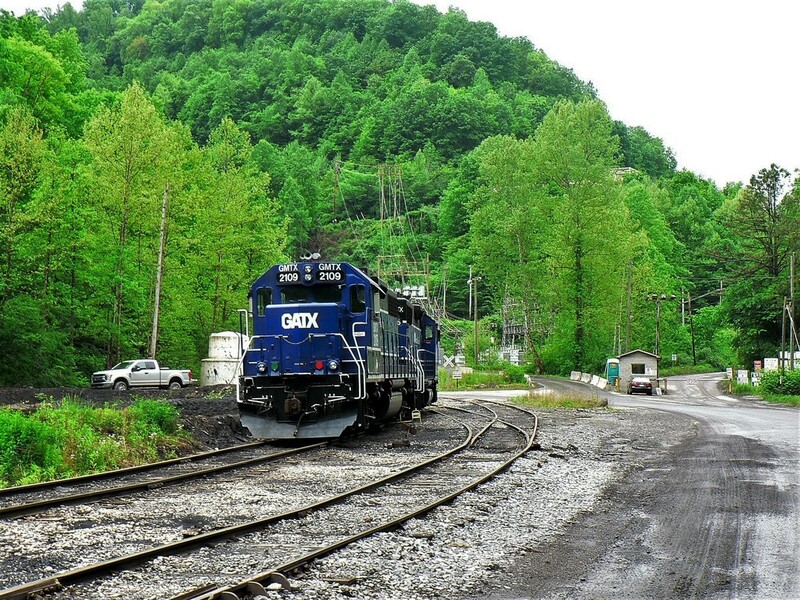 The line was rebuilt to standard gauge as to include 10 miles of total track, six mainline and four yard, an interchange connection established with the C&O, and a barge loading facility constructed on the bank of the Kanawha River. A single coach was operated over the line to serve the people living along Fields Creek and by trackage rights with the C&O, access obtained to the depot at Winifrede Junction. 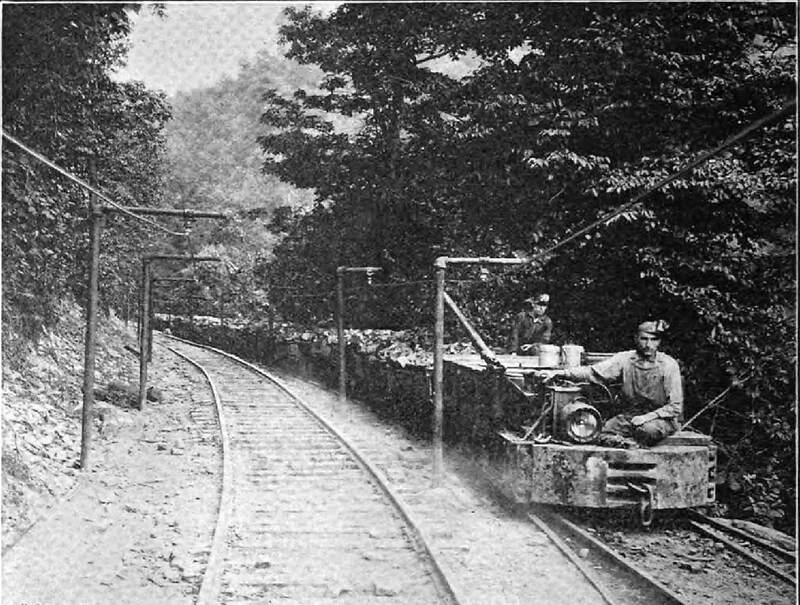 Early 1900s scene at one of the mines served by the Winifrede Railroad. Electric powered locomotive pushing a rail cart modified as a water sprayer. Note overhead wire above the train .This photo dates to when more than one mine was active on Fields Creek. Image Mining Artifacts.org. 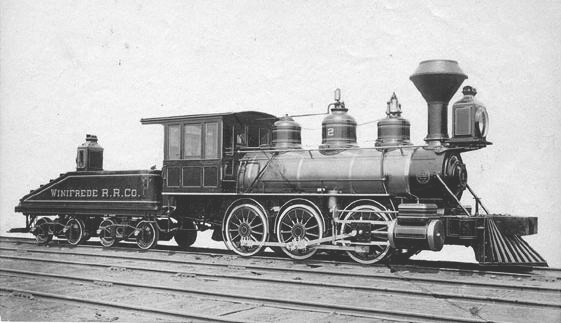 From its beginning in 1882 until early in the 20th century, the Winifrede Railroad operated two 2-6-0 Moguls numbered #3 and #4, respectively. 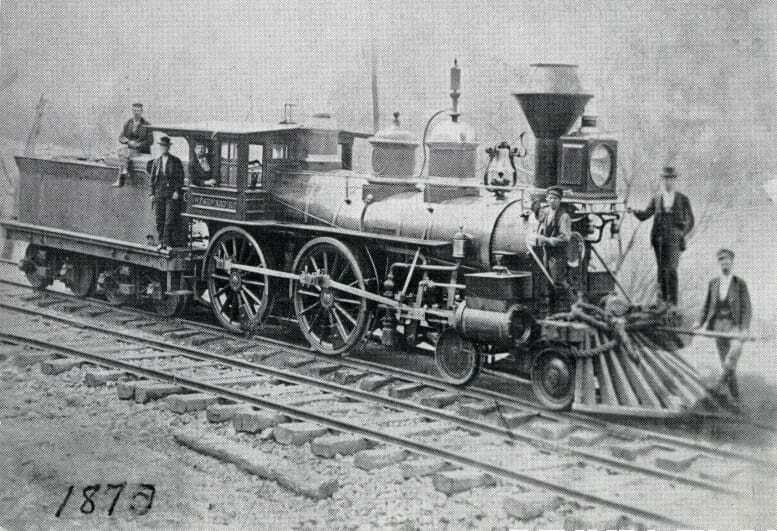 A photographic record indicates that a 0-6-0 locomotive was also on the property. The route presented challenges for these locomotives with a number of sharp curves and no turntable on which to spin them. There is no evidence of a wye having been in place nor do period maps indicate one existed---of course, if one did exist, it was not included on a map. 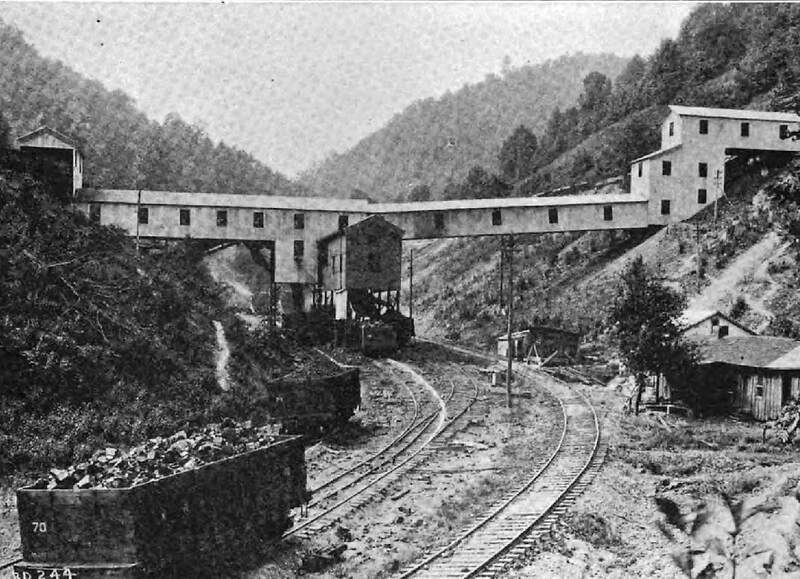 The Winifrede South Mine and incline as it was during the early 1900s. 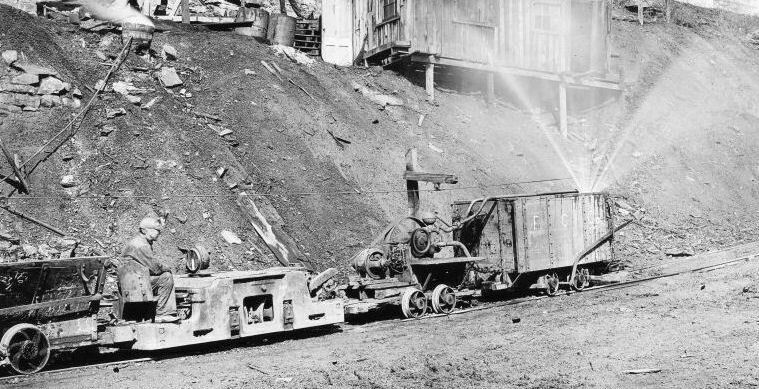 One of five operational mines in existence on the Winifrede Railroad in the beginning of the 20th century. Image West Virginia and Regional History Center. 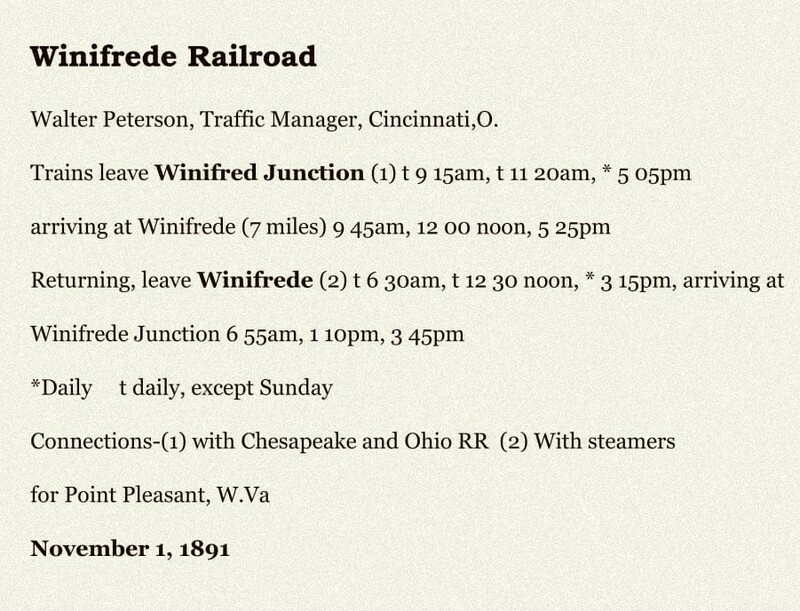 By the year 1900, the Winifrede operated nearly 6.5 miles of main track and 3.3 miles of total yard track. In 1911, the following mines were in operation along the Fields Creek drainage: No. 120 Winifrede Gas Mine with a seam thickness of 28-34 inches; No. 121 South Mine with seam thickness 5.5 -8 foot thickness; North Pick Mine at Winifrede--- seam 5-6 feet; North Machine Mine also at Winifrede—seam 4-5 feet; and the West Mine with a seam of 3.5-5 feet thick. The 1920s were a period of turmoil for the Appalachian coal industry. It was during this period that workers—disgusted by the treatment received by coal company operators---began the movement for labor unions and improved working conditions. This span was marked by violence with decreased production and is the darkest chapter in mining history at nearby Cabin and Paint Creeks. 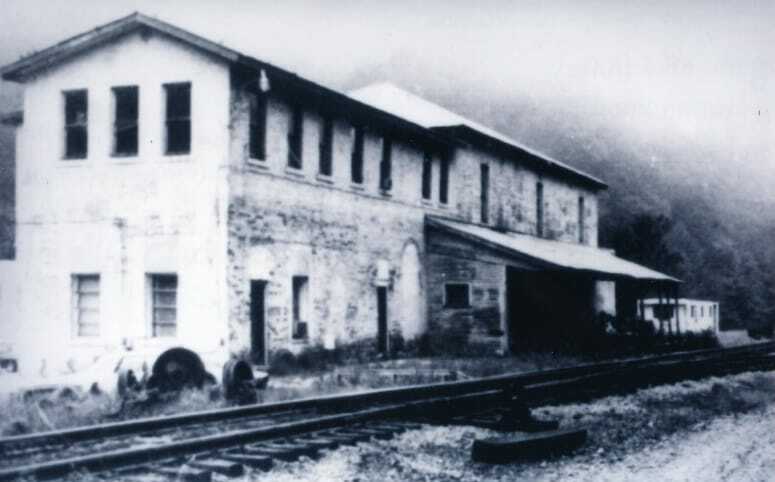 During this era of the 1920s, the mines along the Winifrede Railroad ceased operation and the railroad shut down due to decreased demand. On December 30, 1930 the railroad resumed operations under the name of Winifrede Collieries. During this era, it acquired a second hand C&O Class G9 2-8-0 renumbered #9 which would remain on the roster until the end of the 1950s. As the decade was in the transition from steam to diesel on American railroads, the Winifrede purchased a GE 70 Tonner in 1957 which it numbered #11 By this date, the Winifrede Collieries had been dissolved ( December 1954) and the company reverted to Winifrede Railroad. A decade later, the company purchased another diesel, an EMD SW1500 which was numbered #13. 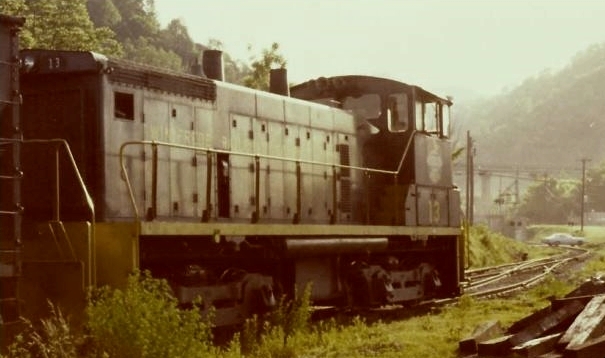 This locomotive operated as the sole power on the railroad for the remainder of the Winifrede era lasting from the 1970s to the 1990s when operations again ceased. In 2000, the West Carbon Mine and loadout was constructed above Winifrede which renewed operations on the railroad. 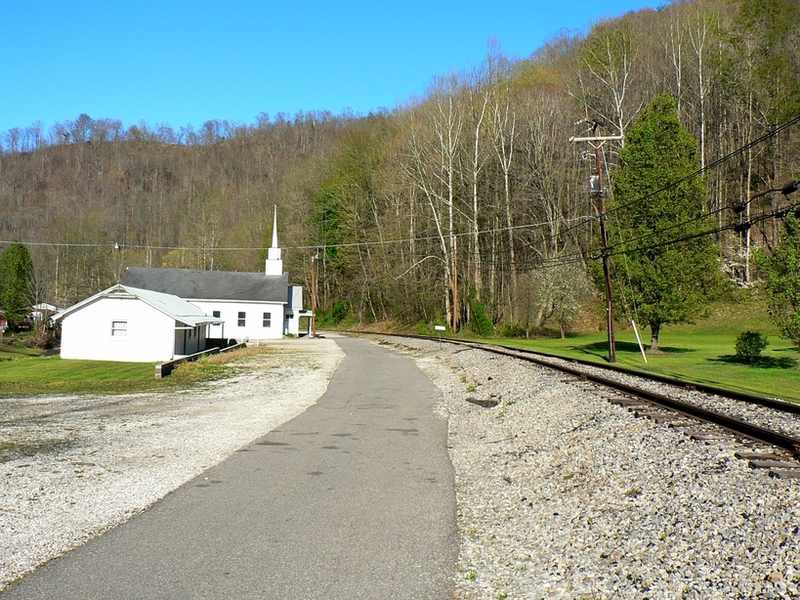 The mine is owned by Kanawha Eagle Coal Company and the railroad christened as the Big Eagle Railroad. 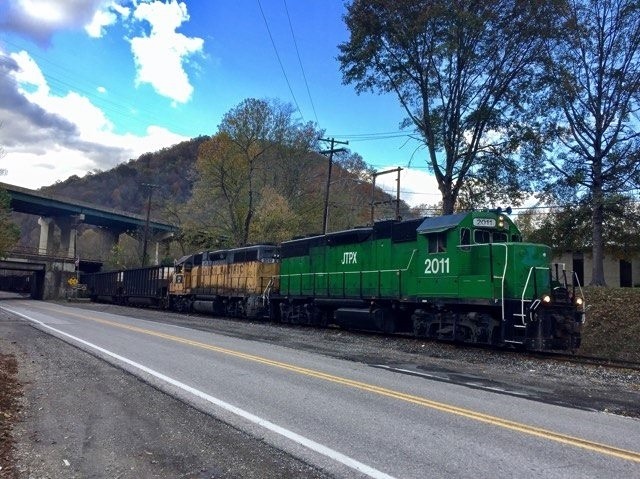 To supplement the aging SW1500 locomotive still on the property, two leaser GP38-2 locomotives of Burlington Northern and Union Pacific lineage were acquired with the reporting marks JTPX #2011 and #2012, respectively. The rail to barge operations resumed until that operation was discontinued in 2013. Today, the railroad interchanges coal trains to CSX of which is primarily for export. SW1500 #13 was the sole locomotive on the property from the 1950s until the dawn of the Big Eagle era. Two views of it here in 1979 at Winifrede Junction---note the Chessie hopper on the left and the rail to barge transloader at right. Images courtesy Jonathan Spurlock. Winifrede RR #13 looks to be departing the yard to run up Fields Creek to the mine with a cut of empties. In the distance is the WV Route 61 grade crossing and the C&O overpass. This 1979 photo was taken from the vantage point of the present day Big Eagle locomotive terminal. Image courtesy Jonathan Spurlock. 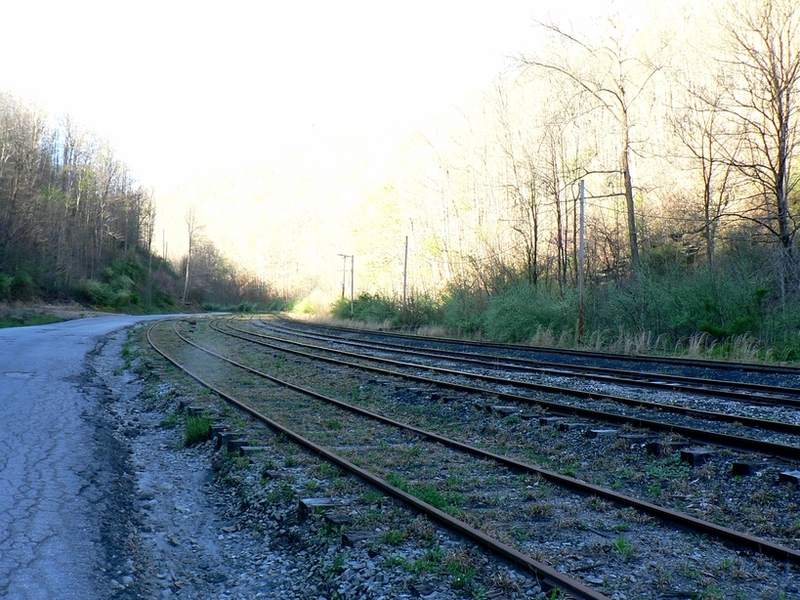 In most cases throughout Appalachia on coal mining branch lines, gravity has proved to run in favor of the railroad. A branch will typically begin at or near the mouth of a stream diverging from a main or secondary line. The track runs upstream and generally on an ascending grade to the mines. This works well because the empty cars run upgrade and loads departing the mines run on a downgrade. The Winifrede Railroad (WFNR) follows this pattern as well. 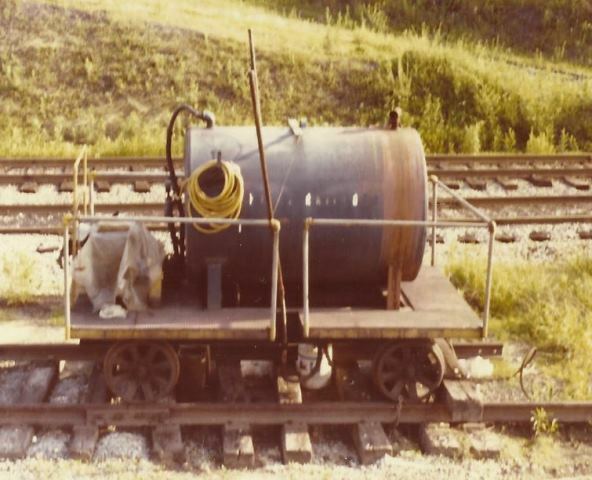 During the Winifrede era when the engine house was utilized, the locomotive would depart for the mine tipple where it coupled to a cut of loaded hoppers. During the passenger era, a coach would be coupled to these runs to coincide with the timetable. 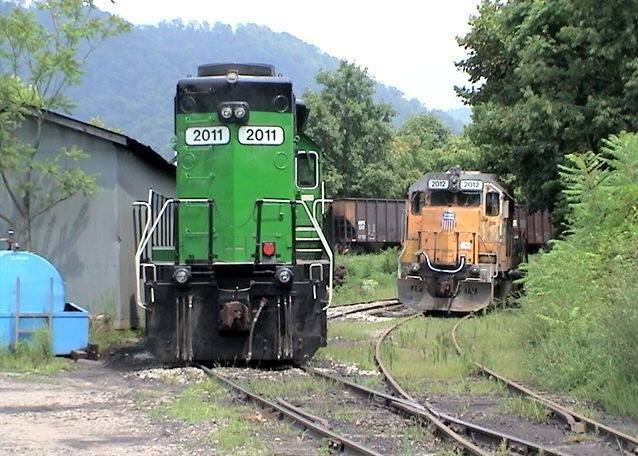 These were then taken to the marshaling yard at Winifrede Junction for transloading onto barges on the Kanawha River. On the return to the mine, a cut of empties would be returned and another group of loads brought down. 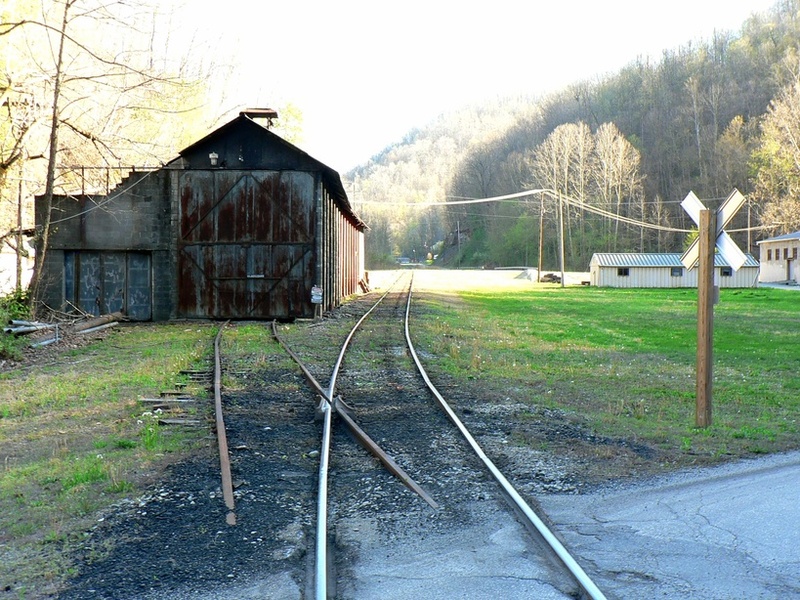 A small yard consisting of multiple tracks is located near the mining region---this provided for car storage and the capability of a locomotive to run around a cut of cars as needed. If returning loads were intended for interchange with the C&O, cuts would be hauled down and assembled for departure. This pattern of operation is cyclic and continues today with the Big Eagle Railroad. As to hopper usage, old WNFR hoppers no longer suited for interchange were kept captive on the Big Eagle. Only CSX and utility owned hoppers could be used for trains departing on CSX. 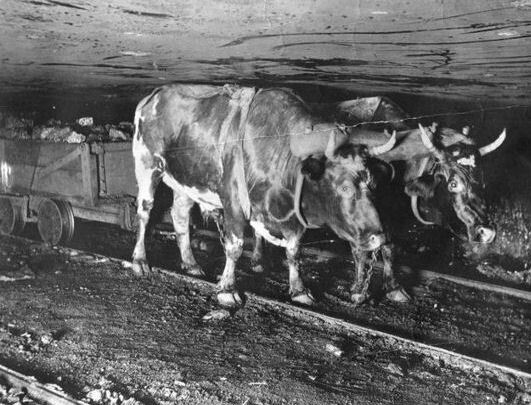 Two examples of Winifrede coal hoppers captive to the railroad. Both were used strictly for mine to river transloading and could not be interchanged to the C&O (Chessie System) when these 1979 photos were taken. 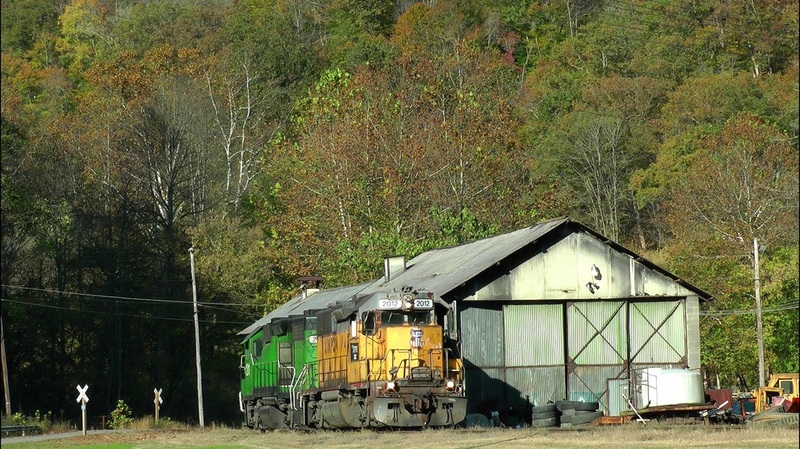 Images courtesy Jonathan Spurlock. .
​The abandonment of the engine house appears to have transpired during the transition era from WNFR to Big Eagle. Today, the locomotives are kept at Winifrede Junction and the daily operations begin at this location instead of further up the line. 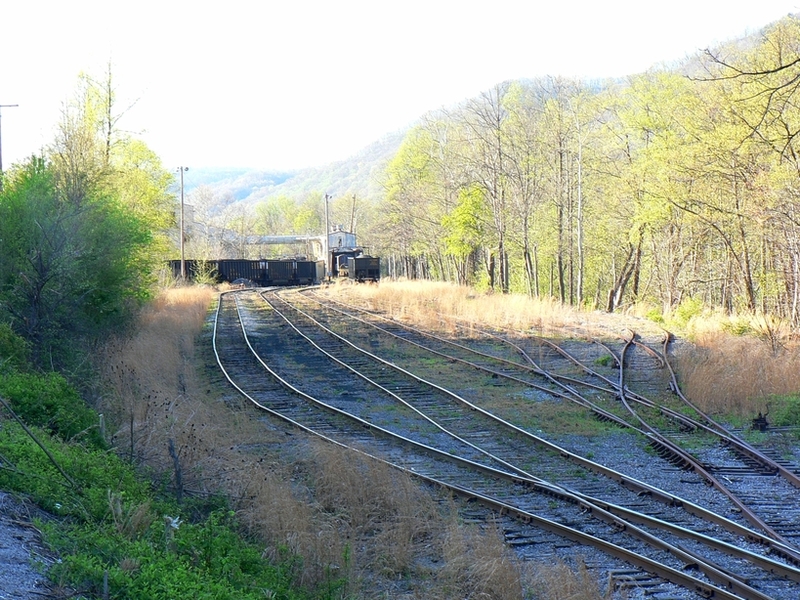 A note about the C&O (CSX) interchange--the junction faces east and the majority of empties also return on CSX. This results in the locomotives facing the interchange. As a result, a CSX train of empties will spot on the mainline and the locomotives will uncouple and run to a crossover towards Chelyan or Marmet to run around the train. It will then couple to the opposite end and shove the empties onto the Big Eagle interchange. Present day operations (April 2016) consists of only building trains for interchange to CSX. 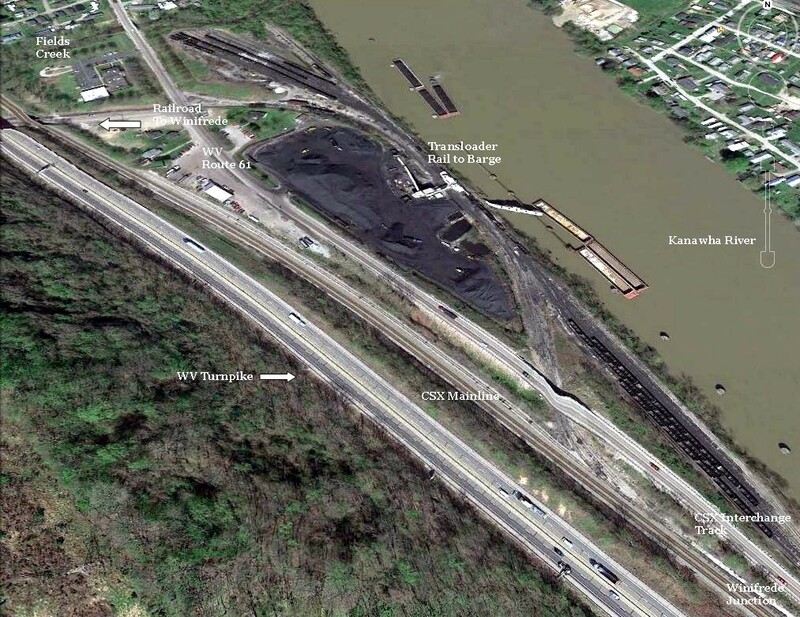 The transloader facility on the Kanawha River ceased barge loading (2013) according to Appalachian Rail Services, the operator of the railroad. Captive hoppers that were used for transloading were removed in 2013. The best method of placing the Winifrede Junction/river terminal area in perspective is with a Google Earth snapshot. This view provides a look at the operation and track layout. At the time of this writing in April 2016, the Appalachian coal industry is under siege with incoming from different directions. Low natural gas prices, anti-coal environmental regulations, political opposition, and the closing of or conversion to natural gas by coal fired power plants. The coal industry has experienced economic low points throughout its history but never on such a scale as witnessed today. All of these catalysts have combined to create a domino effect with adverse results---loss of mining and railroad related jobs, devastated local economies in which they exist(ed), and the mass exodus of people fleeing the region in search of work elsewhere. In its wake is the creation of ghost towns. 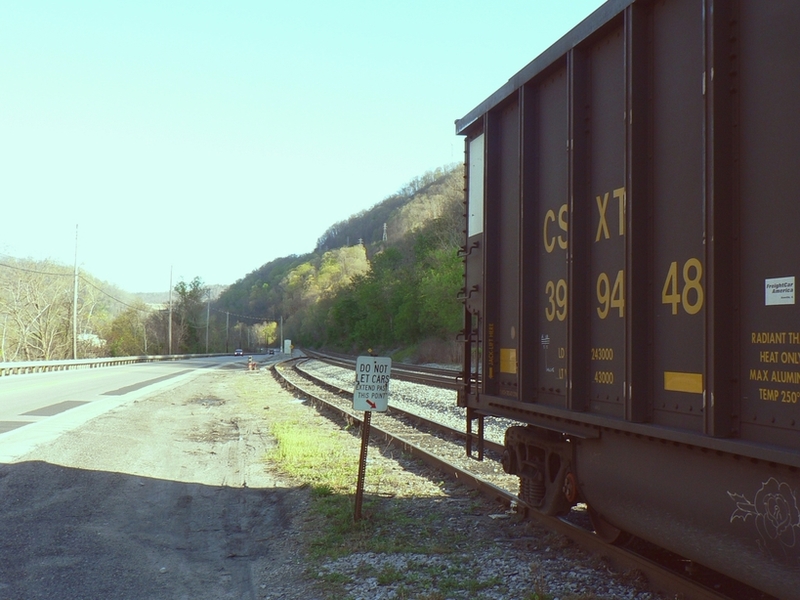 ​Against this backdrop, the Big Eagle Railroad hangs by a precarious thread in that is dependent on a single mine and company. It is also integrated into a history of the Winifrede track record that experienced shutdowns throughout its lengthy past. One has the feeling, however, that the next closure may indeed be the final one based on current circumstances. Hopefully, this little railroad can defy the odds and continue to operate foremost for all those whose livelihoods depend on it and for the railfan and historian wishing to experience the flavor of yesteryear. Addendum: The JTPX #2011 and #2012 are no longer on the roster and were sold during late 2017. 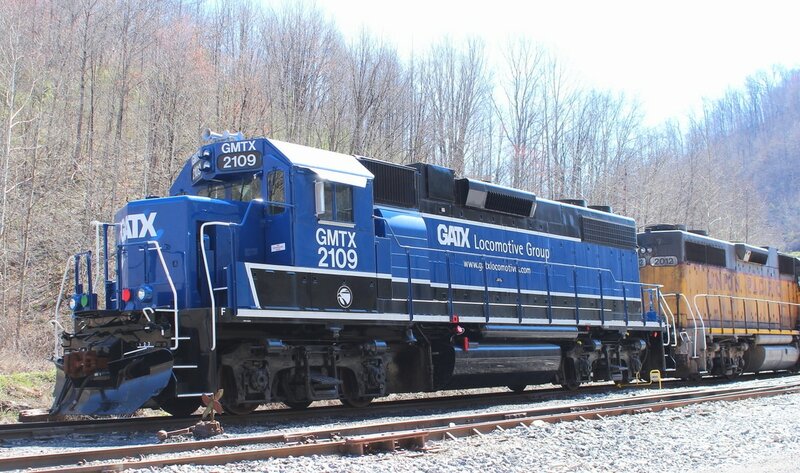 Another GMTX GP38-3 was acquired as a replacement. Modeling the Winifrede or Big Eagle Railroads offers possibilities for an assortment of reasons: (1) Extensive time period---1850s to present (2) size of the prototype railroad can be scaled to incorporate actual elements or scenes (3) rail and river facilities (4) small motive power and rolling stock rosters and (5) scenic appeal. If one wishes to adhere true to the prototype, steam locomotives such as an 0-6-0, 2-6-0, and a 2-8-0 will be exact. 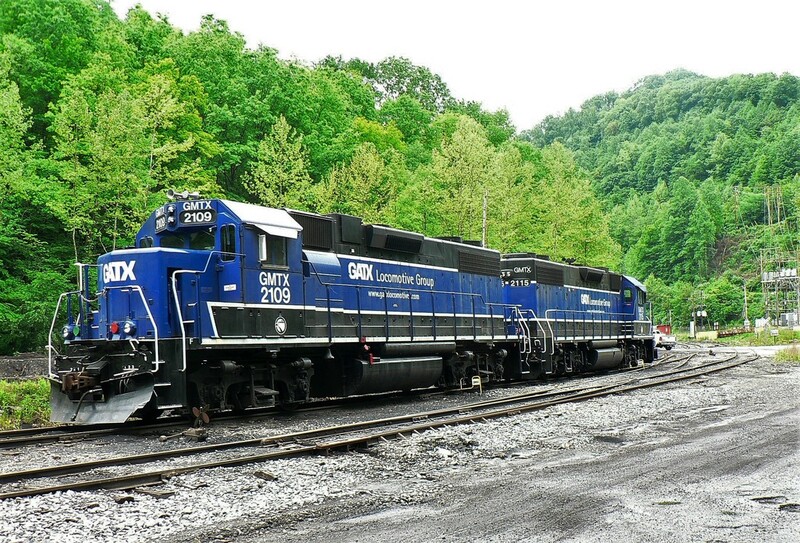 Diesels would consist of a GE 70 Tonner, EMD SW1500 and/or GP38-2s. Hopper cars would include those lettered for the Winifrede, C&O, Chessie System mix, or present day CSX. To represent the passenger era, a single coach could be added. Depending on the size of layout that could be constructed, the C&O Railway, the Chessie System era, or present day CSX could be incorporated into the operation. Using modeler’s license, the possibilities of freelancing would be many. Additional steam locomotive types could be a 4-6-0 Ten-Wheeler, 0-8-0 switcher, a 2-6-2 ,or perhaps even a 2-8-2 Mikado. Virtually any four axle diesel locomotives---whether Alco, Baldwin, EMD, or GE---could be substituted realistically for the operation. Hopper cars could be any or a mix of Winifrede, C&O, Chessie, or leasers. A couple of small businesses along the line such as a fuel facility or mining supply company could add a few boxcars, tank cars, and gondolas to the mix. The passenger era could be represented with a single coach or if one chose, a doodlebug which would look right at home. In regards to structures, there are kits for engine houses and coal mines that could be a generic representation of those facilities. An advanced modeler could possibly replicate these buildings true to prototype. The greatest challenge would be reproducing the yard and river facilities at Winifrede Junction. Of course, an additional touch would be the inclusion of the Winifrede Junction depot. Scenery would consist of mountains, rocky outcroppings, and trees---bunches of them. Fields Creek can be modeled as the rushing stream and a section of the Kanawha River port at the layout edge possibly with a couple of barges included. In researching the history of this railroad, I discovered there is some conflicting data and other periods in its history that are vague. In addition, the corporate history is not precise. If the reader discovers any errors, please take the liberty to contact me with any corrections. In the meantime, if any new and/or corrected information is uncovered, it will be updated.